After 9 months hiatus, I had my second jingalala moment with TATA Sky. Here is Jingalala Part 1, in case you are interested. Vivek: Hi, have renewed my annual subscription but it doesn't seem to be reflecting against my TATA Sky account & still a message on the TV screen. CSR: The renewal has not been activated; should I go ahead any initiate? Vivek:Yes, please proceed with the activation. CSR: Sir, there is a slight problem. Vivek: What is it about? Vivek: Sorry, that price is never listed on your website. I paid for what was shown to me during the renewal. 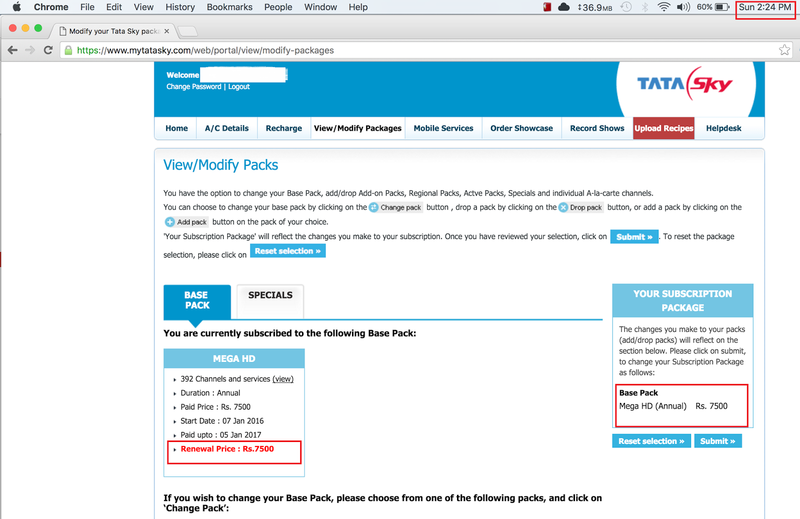 CSR: Sir, actually there is some glitch on the site and hence the latest prices are not reflected on the website. So, you will need to pay the difference amounts for me to proceed with the activation. Vivek: *Surprised to hear that*. Told, will not be paying anything extra as it wasn't my fault in the first place if the site didn't reflect the correct amount. I paid for what the site displayed. Vivek: Have shopped on any of the ecommerce sites; What do you pay for - what is listed on the site or the invisible price that should have showed up? CSR: Yes sir, I have used ecommerce site and agree it is not your fault. But, you need to pay the difference in order to activate. Vivek: Am not paying the difference, coz it ain't my fault nor yours. The fault lies with your business, marketing and QA teams who failed to validate the correct pricing on the product offerings. Please ask the respective team to correct the same so that in the future you don't need to fight with customers. CSR: Sure will pass on the details to the team, but you need to pay the difference. Vivek: I would like to talk to a superior in the chain of command. CSR: Sure sir, please hold the line. Sr CSR: Yes sir, how would I like to help you. Vivek: Have the same conversation once again and same response. Sr CSR: No sir, you need to pay the difference. Vivek: Lost my patience, told him about Jingalala Part 1. I can once again escalate it to your CEO South region and get this problem rectified, if you don't activate. Sr CSR: Sir, What is your subscriber number? Is your TV & setup box on? Sr CSR: Sir, activation completed. Your subscription has been renewed. Vivek: Thank you. But TATA Sky has lost the difference amount thanks to bad validation from Business & Marketing teams. If the pricing isn't updated then customers will not pay the amount and your company will loose the amount. Sr CSR: Agree sir. Will pass on the message to the internal teams. 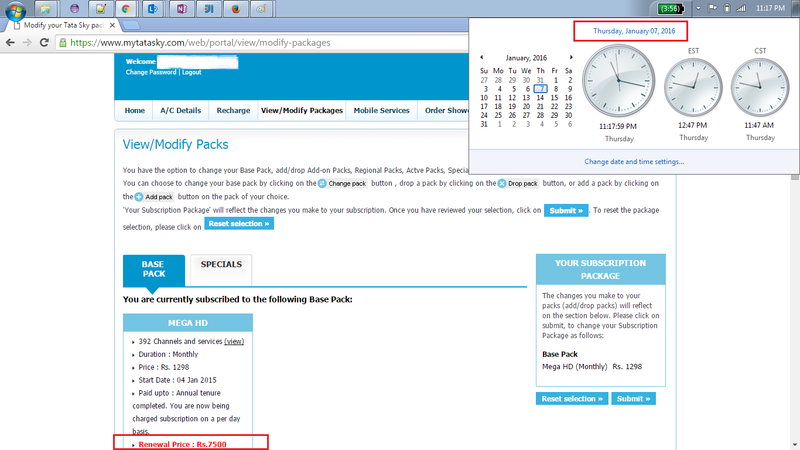 Vivek: I shall check your site after 24 hours and see if you have updated the amount on your website. Sr CSR: Sure sir. Will get it fixed. Vivek: Thank you. Good night. A bit of googling provided the info on the number of DTH (78million) subscribers in India. According to TRAI, there are 39.74 million active DTH consumers in India. Going by the 20% market share of TATA Sky sums up to 7.94 million or 79 Lakhs subscribers. 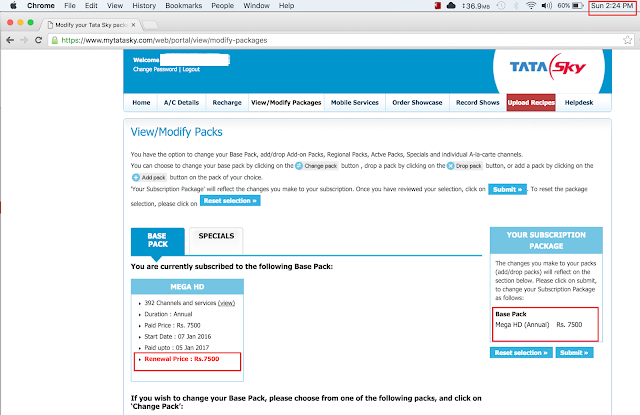 P.S: Not sure how many subscribers would challenge TATA Sky for the pricing errors & not pay the difference.